Kappler purchases nonwovens for incorporation into chemical and biological protective garments and fabrics. Kaytech Engineered Fabrics is a geosynthetic manufacturer based in South Africa. Kaytech is a manufacturer of PET, Polyester Virgin, and Recycled Polyester Continuous Filament Needlepunched Nonwovens, Carded Polyprop, and Polyester fibers Needlepunched Nonwovens, Warp Knitted Polyester Composite Geotextile Fabrics, Geosynthetic Clay Liners (GCL), Geo-container Bags (Shoreline protection), and other erosion control products. The above products are supplied to: Road, Rail, & Airport construction, Mines, Coastal protection, Landfills, and many other markets. Kelheim Fibres is one of the world's leading producers of viscose specialty fibers. The plant in Kelheim, Germany, couples innovative technology with technical expertise and provides outstanding customer service and R&D support. Our high-quality fibers are exported to 43 countries on 5 continents. We build and encourage development partnerships with our customers, using the pilot facilities available in Kelheim to create customized fiber solutions. The applications for our viscose fibers, GALAXY, DANUFIL and VILOFT range hygiene and medical products to technical and household products. Our fibers are used for the production of teabags, wound dressings, wipes, femcare, medical devices and filters. 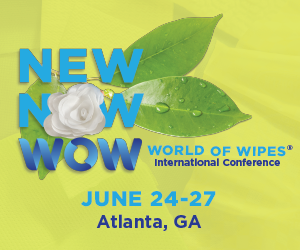 Kleen Test is one if the worlds largest contract manufacturers and packagers of wet wipes, dryer sheets, liquids, nonwovens, and confectionery products. Kraton is a global specialty chemical company and the worlds largest producer of styrenic block copolymers. Polymer is sold to nonwoven companies to make elastic components for personal care and medical markets. The Advance Materials division within Kraton is responsible for high performance polymers to achieve soft touch, improved flexibility and resilience.